Join us at the Gallatin Farmers Market Saturday from 8:00am to 1:00pm! It is a great place to pick up all your vegetables, farm & pasture raised meats, eggs, baked goods, honey, jams & jellies, herbs, plants, and more. There will be both farm and artisan vendors at this week's market. Stop by and see what all the "buzz" is about at your local farmers market. Located just off the Square in Downtown Gallatin. Don't miss out! Come early! Each week will feature a storytime or craft time at 10:00 am. Bring your little ones, along with a blanket, chair, or pillow, and join in the fun, beginning the 1st Saturday in May. 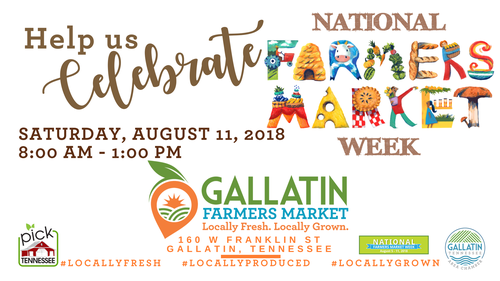 For more information contact the Gallatin Area Chamber of Commerce at 615-452-4000 or email farmersmarket@gallatintn.org.